They saw this scene in the middle of Lake Texcoco, which eventually became their great capital city, Tenochtitlan. The Aztecs prized creatures that could travel between two different realms. The eagle was able to fly close to the sun AND to hunt on earth, so it was linked both to fire and to the sun. They relied on the sun to nourish their crops and provide food for a large empire. 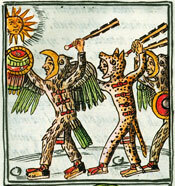 The Aztecs often performed sacrifices to ensure the rising and setting of the sun. 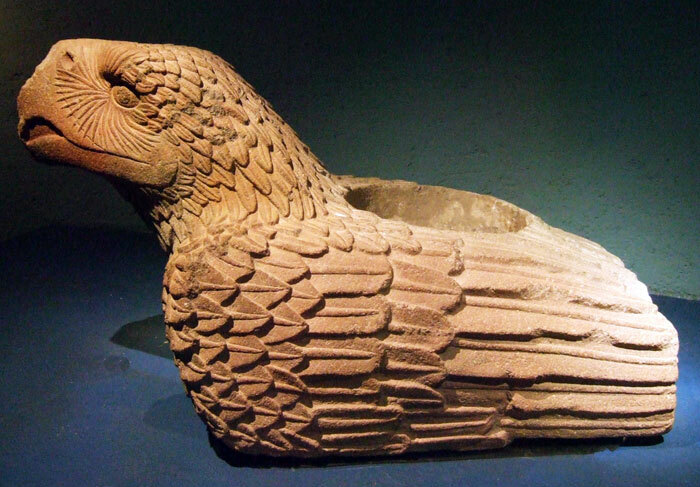 These often included eagle imagery, such as a cuauhxicalli which collected the blood of sacrifice victims. Aztec World Cup final: Eagles versus Jaguars! We are most grateful to Renee McGarry, doctoral candidate in art history at the City University of New York Graduate Center, for writing this first in a series of short introductory pieces on key creatures and wildlife in the Aztec world. Renee’s dissertation, Exotic Contact: Flora and Fauna in Mexica (Aztec) Visual Culture, considers how plants and animals are represented in Aztec sculpture and painted books. 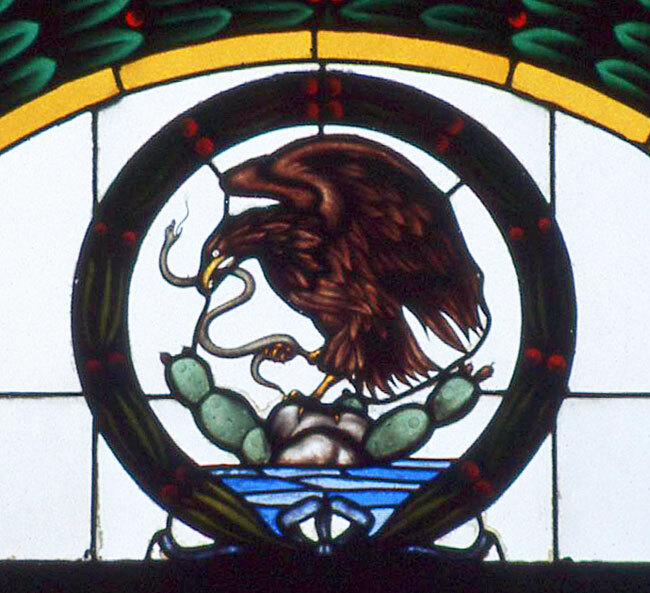 Nearly everyone can guess at the importance of the eagle as animal in modern-day Mexico. It holds a very prominent and special place in the centerpiece of the Mexican flag. 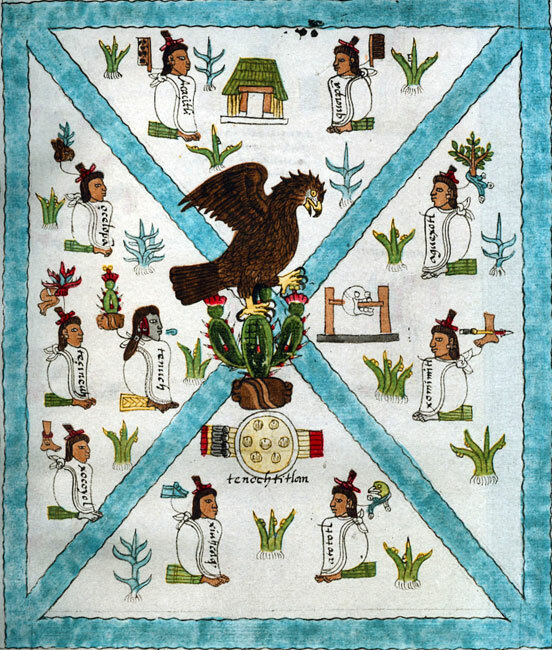 The flag’s image of an eagle resting on a prickly pear cactus while devouring a snake dates all the way back to Pre-Columbian times when it also served as the foundation emblem of the Aztec capital city, Tenochtitlan. The persistence of eagle imagery captures the significance of the animal in Mexican and Aztec history: the very foundation of the powerful Aztec tribute empire was based on the location of the bird in space. The Aztecs legitimated their rule in a long mythohistory (a combination of mythology and historical reality) and strong connection to gods. They founded their capital city on a dictate from their patron god, Huitzilpochtli. Legend has it that during the 14th century, he told a priest that the long Aztec migration would soon come to an end, and they would found a great city on a place where they saw an eagle resting on a cactus. They saw this scene in the middle of Lake Texcoco, which eventually became their great urban center. The specific connection to Tenochtitlan was significant, but the Aztecs and other Pre-Columbian civilizations generally prized animals that had the ability to travel between two different realms. The eagle was able to both fly close to the sun and to hunt on earth. Therefore it was closely associated with fire and the sun itself. (In fact, some now argue that the eagle in the foundation myth and emblem is really a zoomorphic representation of the sun.) The Aztecs also believed the eagle may have played a role in leading the sun across the sky. While hunting, an eagle acts much in the same way as a sunbeam, diving from the sky to grasp its prey on the earth. 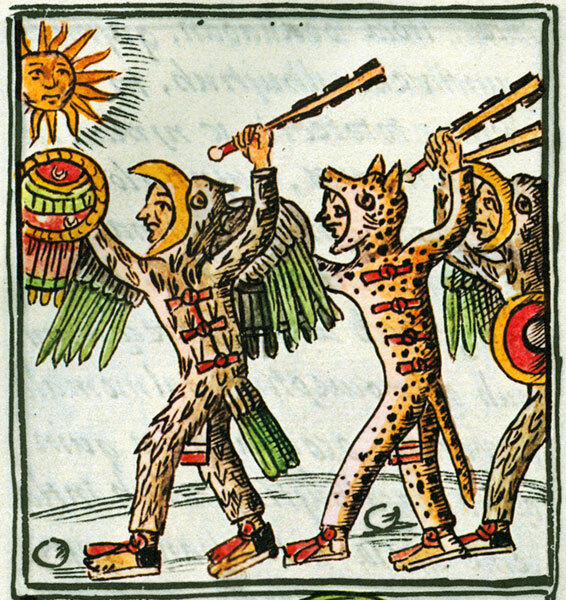 According to Aztecs quoted in The Florentine Codex, a 16th-century encyclopedia of indigenous knowledge compiled by Fray Bernardino de Sahagún, the eagle had intense and exceedingly yellow legs, which provided an additional connection to the sun. The sun was of great importance to the Aztecs, who were an agricultural society. They relied on it to nourish their crops and provide food for a large empire. The Aztecs often performed sacrifices to ensure the rising and setting of the sun. Both auto-sacrifice (or ritual bloodletting) and larger ceremonial sacrifices often included eagle imagery, particularly as a cuauhxicalli which collected the blood of sacrifice victims. 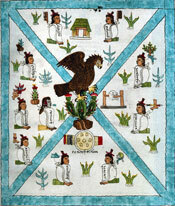 The Aztecs were a warrior society, and the eagle was commonly associated with warriors. The bird was considered brave, daring, and fearless. The Aztecs engaged in wars to obtain sacrifices for their gods and expand their empire. Therefore the eagle’s traits were integral to their survival as a people. One of the most prestigious warrior societies was the Eagle and Jaguar Society, to which only the bravest soldiers were admitted. 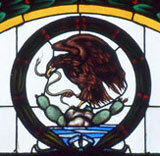 Because the Aztec worldview was based in the concept of duality, the Aztecs paired the daytime eagle with the nocturnal eagle. This eagle had a malevolent side and was associated with death. It only hunted at night and thus eliminated the powerful correlation with the sun. 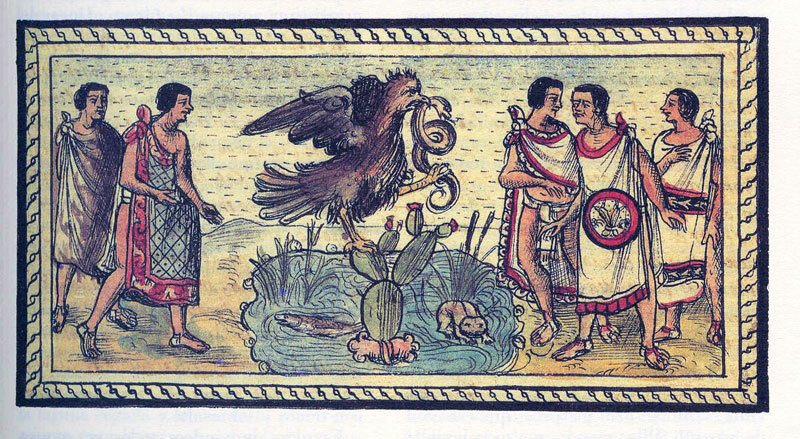 The nocturnal eagle firmly positioned the animal in Aztec cosmovision, a worldview that valued complementary opposites. 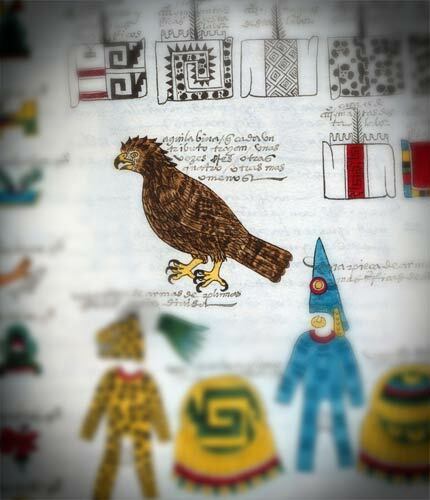 • Florentine Codex image (original in the Biblioteca Medicea Laurenziana, Florence): scanned from our own copy of the Club Internacional del Libro 3-volume facsimile edition, Madrid, 1994. I am so tired of this entire website using past tense verbiage. Thanks for erasing natives yet again, white people. Mexicolore replies: Jeez, keep your hair on. We tend to use the past tense when talking about the past, and the present tense when talking about the present. We like to assume it’s what most people do when studying history. What do you do - swap them round?! We had no idea it can be so controversial! Mexicolore replies: We’re planning a feature on eagle and jaguar warriors. To qualify for either rank, you had to have captured at least 4 enemy warriors. You were allowed to wear very special uniforms, jewellery that few others were permitted, you could dress in cotton and wear sandals in the emperor’s palace, to eat human flesh and drink octli/pulque in public and so on. Both commoners and nobles could rise to these ranks, though sons of nobles stood a better chance because they were given better training at the élite school called the calmécac.